The Itaim Bibi mortar and pestle herb grinder is the perfect modernist kitchen accessory. 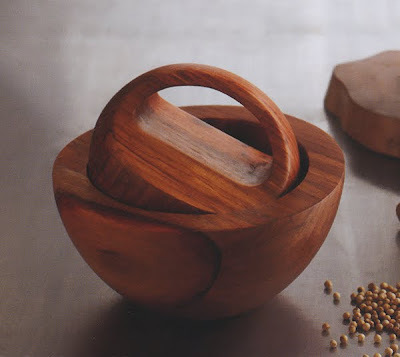 A beautifully sculptural wooden herb mortar and pestle. The profile of the pestle mirrors the interior of the mortar, so it produces a "full contact" effect. Visually, the weight of the pestle is enveloped by the mortar in an organic way. The handle is comfortable to hold thanks to it's special ergonomic design. Fun to hold, and efficient in its grinding function. The Itaim Bibi modernist mortar and pestle is perfect for grinding dried herbs. Expertly crafted by master craftsmen from solid Acacia wood. This beautiful mortar and pestle makes a great gift idea for yourself or your loved ones.